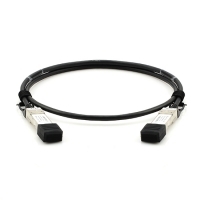 Although optical transceiver and fibre patch lead keep their leading position in connecting switches and servers of data centre, DAC twinax cable still takes a place in intra-rack connection because of its unique advantages of convenience and low price. What is twinax connector? It is a “transceiver-shaped” plug equipped at each end of the DAC twinax cable. This article will mainly introduce DAC twinax cable, the types of twinax connector and try to help you choose DAC twinax cable. What is DAC twinax cable? It’s a kind of direct attach cable (DAC) used to connect switches to servers or routers. DAC twinax cable consists of fixed length of copper cable and twinax connectors on each end. Twinax cable is widely used in local area network, data centre, and high-performance computing connectivity and etc. It’s a cost-effective, low power consumption and low latency solution which is ideal for high-density network. Besides, DAC twinax cable is flexible for the connection within racks. Two kinds of DAC twinax cable, passive DAC and active DAC differ in their components. Active twinax cable contains electrical components while passive twinax cable doesn’t has electrical parts. Not only that, with different connectors, DAC twinax cable can support different data rate. Why do we need different types of twinax connector? Because DAC twinax cables with different connectors can support different data rate applications. Various types of twinax connector of DAC have covered the main data transmission needs in data centres. For example, twinax SFP+ is designed to work with equipment that have 10G SFP+ interface. There are DAC twinax cables with the same connectors at each end such as 10G twinax SFP+ to SFP+, and DAC breakout cables for 10G to 40G or 25G to 100G connection designed to meet the requirement of migration. When you choose DAC twinax cable, max data rate and cable length are important factors to consider. As you can see in the previous part, there are many types of twinax cables designed to meet the interconnection requirements of different speed networks. So, It’s important to choose the right twinax cable according to your network requirements. FS provides quality twinax cables with different data rates, which are compatible with major brands on the market, including Cisco twinax cables. Every DAC is tested strictly in FS factory before shipping, so the brand compatibility is guaranteed. Besides, FS provides customised service of producing DAC and AOC cable with different brand connector at each end. For purchasing more high quality DAC with low cost or for more products’ information, please contact us at sales@fs.com. This entry was posted in Direct Attach Cable and tagged 10g twinax, twinax cable, twinax connector, twinax sfp+ on September 28, 2018 by Admin. 10GBASE-T vs SFP+ vs SFP+ Cable, Which to Choose for 10GbE Network? The dramatic growth in data center requires the higher-performance servers, storage and interconnects. From initial 100M, 1G, 10G, to 40G and 100G, high speed Ethernet has never stopped developing. The standard for 10 Gigabit Ethernet (IEEE802.3ae) was ratified in 2002. In 10 Gigabit Ethernet, there are mainly three media: 10G SFP+ transceiver, SFP+ DAC cable and 10GBASE-T SFP transceiver. This post will discuss 10GBASE-T vs SFP+ vs SFP+ cable. SFP+ (small form-factor pluggable plus) supports both fibre optic cables and DAC (direct attach cable). It delivers a wide variety of 10GbE Ethernet connectivity options for data center, enterprise wiring closet, and service provider transport applications. But it has the limitations that will prevent the media from moving to every server. SFP+ cable is designed for 10GbE access layer interconnection in data center. It includes direct attach copper cables and active optical cables. DAC is a lower cost alternative to fibre, but it can support limited transmission distance and it’s not backward-compatible with existing GbE switches. DAC requires the purchase of an adapter card and requires a new top of rack (ToR) switch topology. DAC is more expensive than structured copper channels, and cannot be field terminated. 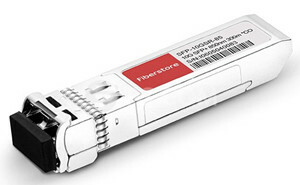 10GBase-T SFP enables 10GbE connections with unshielded or shielded twisted pair cables over distances up to 100 metres. 10GBase-T technology appears as SPF is not compatible with twisted pair cabling system typically used in data centers. With 10GBase-T SFP, the migration from 1GbE to 10GbE can be easily achieved. Low latency becomes so important since the adoption of private cloud applications increases. It’s beneficial for ensuring fast response time and reducing CPU (center processing units) idle cycles so that improve data center efficiency. As to 10GBASE-T SFP, the physical connection (PHY) standard uses block encoding to transport data across the cable without errors. The block encoding requires a block of data to be read into the transmitter PHY, a mathematical function run on the data before the encoded data are sent over the link. It happens the same on the receiver side. This standard specifies 2.6 microseconds for the transmit-receive pair, and the block size requires latency to be less than 2 microseconds. While 10G SFP applies simplified electronics without encoding, and common latency is around 300 nanoseconds per link. You may think that two microseconds are not high. But what if a TOR infrastructure where traffic is passing 4 hops to reach the destination? 10.4-microsecond delay will be caused when using 10GBASE-T SFP. The following table tells details about the latency of SFP+ cable, 10G SFP and 10GABSE-T SFP for different number of links. From the above table, it shows that the latency of 10GBASE-T SFP is the highest. As network links grow, the latency turns to be higher. It’s known that the lower latency, the faster the network speed. High latency in the data center infrastructure results in delays in CPU and application works, therefore limiting data center efficiency and increasing operational costs. Power consumption is also one of the important factors to be considered in data centers. Engineers are sensitive to power consumption and find a way to seek the lowest possible power consumption technologies. It’s said that every watt of power consumed, typically two additional watts are needed for cooling. 10GBase-T components today require anywhere from 2 to 5 watts per port at each end of the cable depending on the distance of the cable. But 10G SFP requires about 0.7 watt regardless of distance. The figure below compares the power consumption of three media options of 10GbE Ethernet. From this figure, suppose there are 10000 ports in the data center, 10G SFP can greatly save the power. 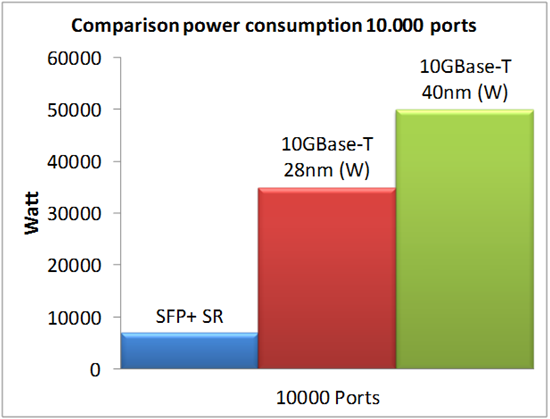 On contrary, 10GBASE-T components consumes the most power. Thus, to save power in the data center, 10G SFP and SFP+ cable should better be selected when deploying thousands of cables in a data center. From this article, 10G SFP+ and SFP+ cable solutions are better than 10GBASE-T SFP for 10G data center. But 10GbE is not the ultimate goal. Besides factors mentioned in this article, you should also select a cabling solution which can support not only current needs but also future data center deployments when you design 10GbE network. You can find various SFP+ modules and 40G QSFP+ from FS.COM. Related article: How to Convert SFP+ to 10GBASE-T/RJ45? This entry was posted in Direct Attach Cable, Fiber Optic Transceivers and tagged 10G SFP+, 10GBASE-T SFP, 10GBASE-T vs SFP+, SFP+ DAC on August 31, 2016 by laura. As the increasing bandwidth requirements of private and public cloud data centers and communication service providers, 25Gbps Ethernet over a single lane will have a significant impact on server interconnect interfaces. It may become the new upgrade path to 100G (10G-25G-100G instead of 10G-40G-100G). This article will give brief introduction about 25GbE Ethernet. 25GbE Ethernet standard is proposed for connectivity in the data centers. Because of the increasing demand for higher speed network performance and maintaining Ethernet economics, IEEE agreed to support the development of 25GbE standard in June 2014. 25G Ethernet is defined for 100GbE implemented as four 25Gbps lanes running on four fibre or copper pairs. 100G Quad small for-factor pluggable transceiver (QSFP28) have four lasers, each transmitting 25Gbps. The twisted pair pair standard was derived from 40GbE standards development. The following table shows the main upcoming interfaces for 25Gbps. Number of Lanes 40G QSFP+ interface is constructed from four parallel links. Extending QSFP+ onto fibre requires four parallel 10Gb streams to transport this to the receiving QSFP+ parallel optics. The data transmission is achieved by four lanes which significantly reduce switch port density per switching chip and increases the cost of cabling and optics. While the 25GbE standard requires only a single lane, while delivering 2.5 times more throughput compared to current 10GbE solutions and significantly saving the cost compared to 40GbE solutions. Form Factors The 25GbE physical interface specifications support the form factors including QSFP28 and SFP28. QSFP28 has four lanes and each lanes supports 25 Gbps speed. SFP28 has only one lane and it also supports 25 Gbps speed. Current switch doesn’t support 25G SFP28 port. So the solution for 25G is to use a breakout cable that allows four 25GbE ports to connect to a 100GbE QFSFP28 switch port. First, more data and switch port density. Compared with 10G solution, 25GbE standard can provide 2.5 times more data. And it can also offer 4 times switch port density compared to 40G solution. Second, save the cost. Since it can provide greater port density, fewer ToR switches and cables are needed. In that way, it reduces the construction cost compared with 40GbE. Third, it features lower power and smaller footprint requirements. Due to these special benefits, 25GbE is believed to be popular in no time. 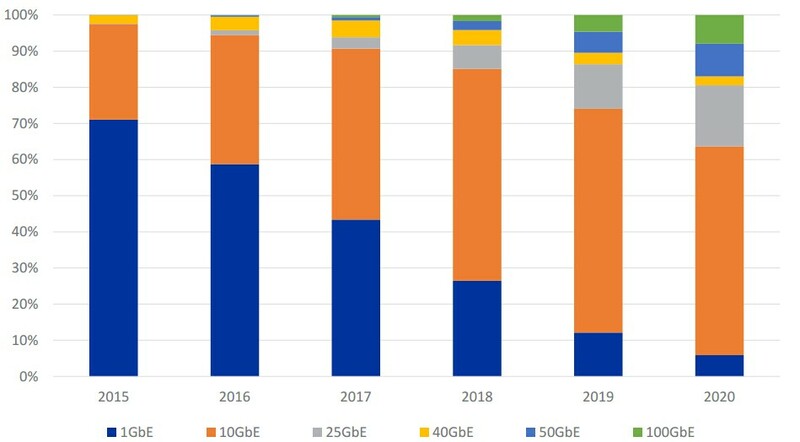 According to a recent five-year forecast, it’s said that annual shipments of 25GbE ports will be 2.5 times greater than 40GbE ports by 2018. FS.COM has released 25G DAC (direct attach copper) cables which include 100G QSFP28 to 4xSFP28 and 25G SFP28 to SFP28 with the length from 1 m to 5 m. QSFP28 refers to the 100G DAC cable using the QSFP+ form factor, and SFP28 refers to the 25G DAC cable using the SFP+ form factor. The form factor remains the same but the new standard will require improved cables and connectors capable of handling additional bandwidth. Existing QSFP+ and SFP+ cable assemblies are not compatible with QSFP28 and SFP28 ports. 25G DAC is designed as the low-cost copper connection for ToR switches. It’s certain that FS will soon release 25GBASE-T interface equipment. 25GBASE-T can support 30 metres long reach with low cost. It’s a cost-effective solution for ToR server connections using point-to-point patch cords, and enable End of Row (EoR) or Middle of Row (MoR) by using the 30 metre structured cabling. The connection can be achieved with the common use of RJ45 plug and connector. Compared with 25G DAC, it seems to be a more suitable way. 25GbE can provide up to 2.5 times faster performance than existing 10GbE connections while maximizing the Ethernet controller bandwidth/ pin and switch fabric capability. It can also provide greater port density with lower cost compared to 40GbE solutions. It’s analyzed that 25G will limit the deployment of 40G QSFP+ ports. By now, FS.COM has released 100G QSFP28 to 4xSFP28 and 25G SFP28 to 25G SFP28 DAC cables for 25G network. In the near future, there will more equipment for 25G including 25GBASE-T transceiver. Let’s look forward to it. This entry was posted in Direct Attach Cable and tagged 100G, 25G, QSFP28, SFP28 on May 6, 2016 by laura. Quad small form-factor pluggable plus (QSFP+) direct attach copper (DAC) cables are suitable for in-rack connections between QSFP+ ports of EX Series switches. They are suitable for short distances of up to 10 metres, making them ideal for highly cost-effective networking connectivity within a rack and between adjacent racks. This article will introduce EX Series switches and QSFP+ DAC for EX Series switches. EX Series switches deliver scalable port densities and carrier-proven high availability features that consolidate legacy switch layers, helping to reduce capital and operational expenses and advance the economics of networking. For example, the EX 4200 series Ethernet switches with Virtual-Chassis technology, deliver the same Gigabit Ethernet (GbE) and 10GbE port densities as traditional chassis-based switches, but at one-eighth the footprint and less than one third the cost. The EX Series switches are right-sized for campus, data centre and remote office environments and feature many of the same carrier-class hardware and software architectures found in core routers that were purpose-built to support the convergence of data, voice, and video onto a single always-on network. By alleviating the cost, complexity and risk associated with legacy switch infrastructures, the EX Series switches enable high-performance businesses to deploy a high-performance network infrastructure based on three key tenets – operational simplicity, carrier-class reliability, and integration and consolidation – to enable ubiquitous access to strategic assets, reduce network downtime and enhance overall security to shared assets across the extended enterprise. QSFP+ direct attach copper (DAC) cable is hot-removable and hot-insertable. 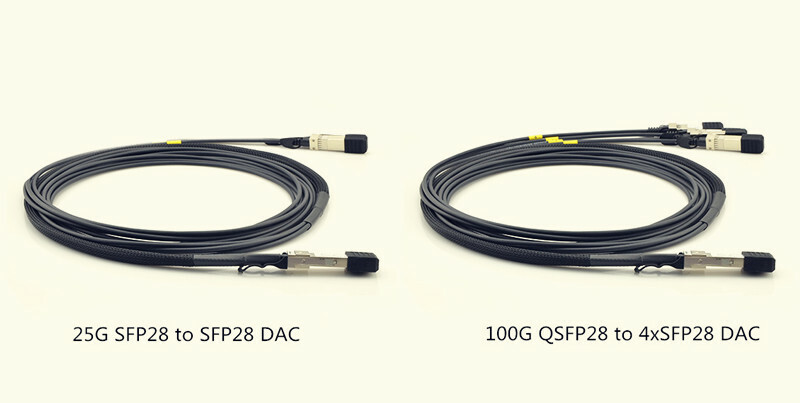 QSFP+ DAC mainly has two kinds. One is a cable that connects directly into two QSFP+ modules, one at each end of the cable. The cables use integrated duplex serial data links for bidirectional communication and are designed for data rates up to 40 Gbps. The other is a breakout cable consisting of a QSFP+ transceiver on one end and four SFP+ transceivers on the other end. The QSFP+ transceiver connects directly into the QSFP+ access port on the QFX Series device. The cables use high-performance integrated duplex serial data links for bidirectional communication on four links simultaneously. The SFP+ links are designed for data rates up to 10 Gbps each. The following table describes the software support for QSFP+ passive DAC cable lengths on EX Series switches for Junos OS releases. 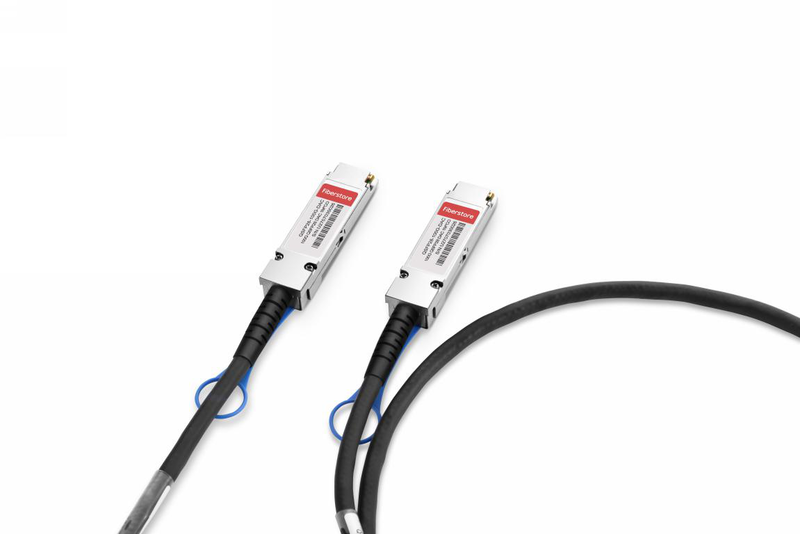 QSFP+ direct attach copper cables can provide cost-effective and reliable 40G speed connections for EX Series switches with distances reaching up to 10 metres. As the leading fibre optical manufacturer in China, FS.COM offers a wide selection of QSFP+ DAC with low cost but high performance. In addition, 10G SFP+ to SFP+ DAC (eg. HP JD096C), 25G SFP28 to SFP28 DAC, 40G QSFP+ to 4 XFP DAC, 100G QSFP28 to QSFP28 DAC, 100G QSFP28 to 4 SFP28 DAC are also available for your choice. All these DACs are with 100% compatibility and can be customised according to your special requirements. This entry was posted in Direct Attach Cable and tagged EX Series switches, HP JD096C, JD096C, QFX-QSFP-DAC-1M on April 18, 2016 by Admin. These cables for Cisco 40-gigabit compatible solution,which is provided by the Fiberstore. Now available 40G QSFP cable: 40G QSFP+ DAC Cables from Fiberstore Interconnect Solutions in lengths up to 100m (330′) for 40-Gigabit compatible solution. Buy direct from the World’s Largest QSFP+ cable OEM and save with new discounted Cisco QSFP Cables. Here are four kinds of DAC Cables for Cisco 40-Gigabit Compatible Solution. QSFP-H40G-CU series products are compatible for Cisco 40GBASE-CR4 QSFP direct-attach copper cable, 1-10 metre, passive solution. Fiberstore QSFP+ to QSFP+ copper direct attach cables are suitable for very short distances and offer a highly cost-effective way to establish a 40-Gigabit link between QSFP+ ports of Cisco switches within racks and across adjacent racks. We offers passive cables in lengths of 0.5, 1, 2, 3, 4, 5, 6, 7 metres. QSFP-4SFP10G-CU series products are compatible for Cisco 40GBASE-CR4 QSFP to 4 10GBASE-CU SFP+ direct attach cable, 0.5- 5 metres, passive solution. 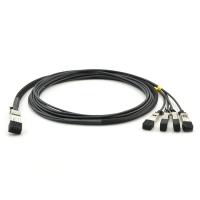 Fiberstore QSFP+ to four SFP+ copper direct-attach breakout cables are suitable for very short distances and offer a highly cost-effective way to connect within racks and across adjacent racks. These breakout cables connect to a 40G QSFP+ port of a Cisco switch on one end and to four 10G SFP+ ports of a Cisco switch on the other end. Our passive cables in lengths of 0.5, 1, 2, 3, 4 and 5 metres. QSFP-4X10G-AOC series products are compatible for Cisco 40GBase-AOC QSFP to 4xSFP+ AOC 1-30 metres solution. Fiberstore 40G QSFP to four SFP+ AOCs are suitable for short distances and offer a flexible way to connect within racks and across adjacent racks. Active optical cables are much thinner and lighter than copper cables, which makes cabling easier. AOCs enable efficient system airflow and have no EMI issues, which is critical in high-density racks. These breakout cables connect to a 40G QSFP port of a Cisco switch on one end and to four 10G SFP+ ports of a Cisco switch on the other end. We offer 40G QSFP to 4xSFP+ AOCs in lengths of 1~30 metres. QSFP-H40G-AOC series products are compatible for Cisco 40GBase QSFP+ AOC cable with direct-attach active optical 1-50 metres’ solution. Fiberstore QSFP to QSFP AOC are suitable for short distances and offer a flexible way to connect within racks and across adjacent racks. Active optical cables are much thinner and lighter than copper cables, which makes cabling easier. AOCs enable efficient system airflow and have no EMI issues, which is critical in high-density racks. 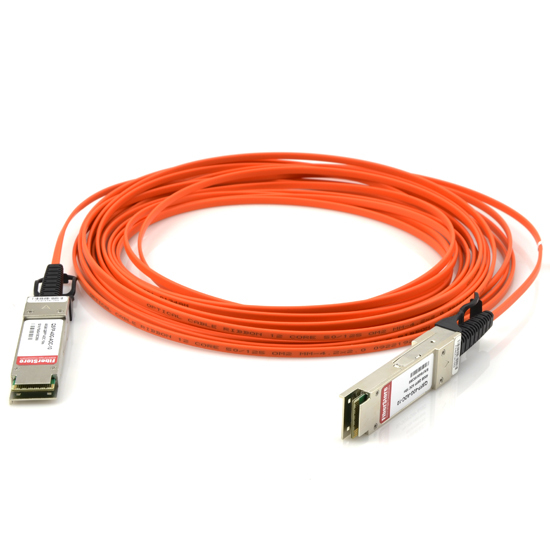 Fiberstore offers 40G QSFP to QSFP AOC in lengths of 1~50 metres. Fiberstore also offers customised service for “cable length”. This entry was posted in Direct Attach Cable, Fiber Optic Transceivers and tagged 40G QSFP+ AOC, Cisco QSFP cable, QSFP+ to 4xSFP+ AOC on June 23, 2014 by Admin. The 40G QSFP+ AOC (40G QSFP+ AOC) is a parallel 40Gbps Quad Small Form Factor Pluggable (QSFP+) Active Optical Cable, which supplies higher port density and total system cost. 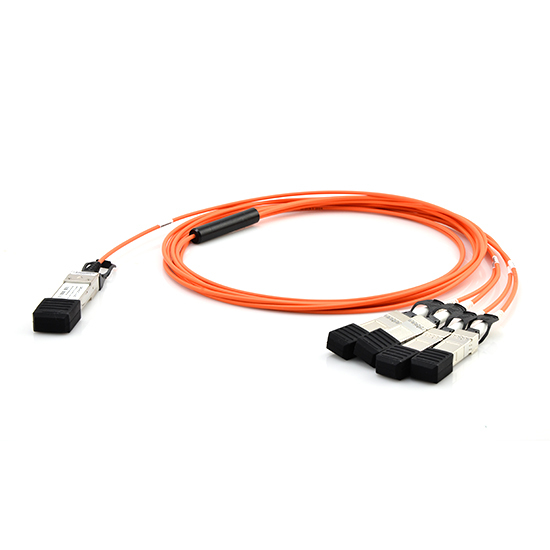 The QSFP+ optical modules provide four full-duplex independent transmit and receive channels, each are able of 10Gbps operation 40Gbps aggregate bandwidth of at least 100m long multimode fibre. The 40G QSFP+ AOC is according to QSFP+ Multi-Source Agreement(MSA) design and shape, optical/electrical connections and digital diagnostic interface. It is designed to meet the most demanding external operating conditions including temperature, humidity and EMI interference. This module supplies a quite high functionality and feature integration, through a two-wire serial interface to reach. The TF-QQxxx-N00 converts parallel electrical input signals using a laser driver and a Vertical Cavity Surface Emitting Laser (VCSEL) array into parallel optical output signals. The transmitter module accepts electrical input signals which can be voltage suitable for Common Mode Logic (CML) levels. All input data signals are differential and therefore are internally terminated. The receiver module converts parallel optical input signals using a receiver and a photo detector array into parallel electrical output signals. The receiver module outputs electrical signals, which are voltage suitable for Common Mode Logic (CML) levels. All data signals are differential and support a data rates as much as 10 Gbps per channel. A single+3.3V power is needed to power up the module. Both power source pins VccTx and VccRx are internally connected and will be used concurrently. As per MSA specifications the module offers 7 low speed hardware control pins (including the 2-wire serial interface): ModSelL, SCL, SDA, ResetL, LPMode, ModPrsL and IntL. Module Select (ModSelL) is an input pin. When held low by the host, the module responds to 2-wire serial communication commands. The ModSelL allows the use of multiple QSFP+ modules on a single 2-wire interface bus ¨C individual ModSelL lines per QSFP+ module can be used. Serial Clock (SCL) and Serial Data (SDA) are needed for the 2-wire serial bus communication interface and let the host to connect to the QSFP+ memory map. The ResetL pin to produce a complete module reset, the return capsule back to the default state , when within the ResetL pin low hold time is longer than the minimum pulse length . Master reset should be performed bit desperate state until reset interrupt instructions to finish the module . Low Power Mode (LPMode) pin can be used to set the maximum power consumption for the module so that you can protect hosts that aren’t capable of cooling higher power modules, should such modules be accidentally inserted. Module Present (ModPrsL) is a signal local to the host board which, even without the a module, is generally pulled up to the host Vcc. When a module is inserted in to the connector, it completes the path to ground though a resistor on the host board and asserts the signal. ModPrsL then indicates a module happens by setting ModPrsL to a “Low” state. Interrupt (IntL) is an output pin. When “Low”, it indicates a probable module operational fault or a status critical to the host system. The host identifies the origin of the interrupt with all the 2-wire serial interface. The IntL pin can be an open collector output and should be pulled to the Host Vcc voltage on the Host board. 40G QSFP+ Active Optical Cable (AOC) is a high performance, low power consumption integrated cable for short-range multi-lane data communication and interconnect applications, supporting 40G Ethernet, fibre channel and PCIE. It is compliant using the QSFP+ MSA and IEEE P802.3ba 40GBASE-SR4. It has been designed to meet the harshest external operating conditions including temperature, humidity and EMI interference. FS.COM QSFP+ Cables can be found in various lengths along with other options. This entry was posted in Direct Attach Cable and tagged 40G QSFP+ AOC, QSFP+ cables, QSFP+ modules on June 5, 2014 by Admin. QSFP+ (Quad Small Form-Factor Pluggable Plus) cables offer a high density, high bandwidth, cost-effective solution for a number of markets and applications including switches, routers, HBA’s, top rated computing and mass storage sub-systems by mfr’s such as IBM, qLogic, Cisco, etc. QSFP+ cables like QSFP to QSFP trunk cable and QSFP to SFP+ breakout cable are created for data rates up to 40Gb/s supporting Fibre Channel, Ethernet, SDH/SONET and Infiniband standards. Breakout cable is a hybrid solution. In a breakout cable, each fibre is treated like a separate unit, complete with a sheath and strength member. This design eliminates the necessity for a breakout kit, as the sheath allow you to attach connectors easily. Breakout cable lets fibre subunits move freely, and so they protect each fibre due to their thicker coating/strength member arrangement. Each fibre subunit is configured as a tight tube. Breakout cables also come designed with a separate strength member similar to the loose-tube design. Breakout cable is really an optical fibre cable containing several jacketed simplex optical fibres packaged together in an outer jacket. This can be different from distribution-style cable, in which tight-buffered fibres are bundled together, with simply the outer cable jacket of the cable protecting them. The style of breakout-style cable adds strength for ruggedized drops, though the cable is greater and much more expensive than distribution-style cable. Breakout cable is acceptable for brief riser and plenum applications as well as use in conduits, in which a quite simple cable run is planned to avoid the use of any splicebox or spliced fibre pigtails. Because each fibre is individually reinforced, the cable can be easily divided into individual fibre lines. Each simplex cable inside the outer jacket might be broken out after which continue like a patch cable, for instance in a fibre to the desk application in an business building. This permits connector termination without requiring special junctions, and can reduce or eliminate the need for fibre optic patch panels or an optical distribution frame. Breakout cable requires terminations to be done with simple connectors, which may be preferred for some situations. A more common solution today is the use of a fanout kit that adds a jacket to the very fine strands of other cable types. QSFP to SFP+ breakout cables create a great cost-effective interconnect means to fix IT professionals by giving much needed space for data centres and cost cuts. QSFP to SFP+ breakout cable provides inexpensive and low power consumption interconnect solution for 40-Gigabit Ethernet, Fibre Channel, QDR InfiniBand, 10 Gigabit applications and other industry standards. We provide QSFP+ to SFP+ passive copper breakout DAC, QSFP to SFP+ breakout AOC and QSFP to 8 x LC AOC. Customised cables can be found in various lengths along with other options. QSFP to SFP+ breakout cables produce a great cost-effective interconnect strategy to IT professionals by giving necessary space for data centers and price cuts. These cables permit you to connect your QSFP+ and SFP+ switches and network cards without upgrading your entire data center or storage array. They can be used for QDR infiniBand, 40 Gigabit Ethernet and 10Gigabit applications. Each QSFP to SFP+ breakout cable includes a single QSFP connector (SFF-8436) rated for 40-Gb/s on one end and (4) SFP+ connectors (SFF-8431), each rated for 10-Gb/s, on the other side. We currently provide several lengths to support your installation requirements. QSFP to SFP+ breakout cables provide low cost and low power consumption interconnect solution for 40-Gigabit Ethernet, Fibre Channel, QDR InfiniBand, 10 Gigabit applications and other industry standards. This entry was posted in Direct Attach Cable and tagged QSFP to SFP+ breakout cable, QSFP+ Breakout Cables, QSFP+ cables on June 4, 2014 by Admin. The dramatic growth of bandwidth requirements has led to the increasing worldwide use of higher-performance servers. This in turn has led to the expanding need for 10 Gigabit Ethernet(10GE or 10GbE or 10 GigE), refers to various technologies for transmitting Ethernet frames at a rate of 10 gigabits per second (10×109 or 10 billion bits per second), is rapidly gaining traction within data centers. The IEEE 802.3ae standard permits distances between physical locations up to 40 kilometers over a single-mode fiber. Both single-mode and multi-mode fiber systems can be used with 10 GbE applications. 10GbE supports both copper and fiber cabling. However, due to its higher bandwidth requirements, higher-grade copper cables are required: category 6a or Class F/ cat 7 cable for links up to 100m. Unlike previous Ethernet standards, 10 gigabit Ethernet defines only full duplex point-to-point links which are generally connected by network switches. Half duplex operation and hubs do not exist in 10GbE. Over the years, improvements in 10GbE technology, price, and performance have extended its reach beyond enterprise data centers to midmarket networks, they confidently deployed 10GbE in their corporate backbones, data centers, and server farms to support high-bandwidth, mission critical applications. There are many 10 Gigabit Ethernet relevant products available, and the direct attach cable(DAC) is one of them. Direct Attach Cables are widely applied in storage, data, and high-performance computing connectivity. They are used to connect one Mobility Access Switch with another when forming a stack. Do not attempt to unplug the integrated copper cable from the transceiver and insert a fiber cable into the transceiver. Common direct attach cables include SFP cables, SFP+ cables, XFP to XFP cables, QSFP+ cables, MIni SAS cables, CX4 cables. These direct attach cables can meet the ever growing need to cost-effectively deliver more bandwidth, and they can be customized in different length to meet your requirement. Small form-factor pluggable plus transceiver (SFP+) direct attach copper cables, also known as Twinax cables, are suitable for short distances up to 23 ft (7 m), making them ideal for highly cost-effective networking connectivity within a rack and between adjacent racks. 10G SFP+ Cable connects from one SFP+ slot to another, without the need for SFP+ transceivers. The Direct-Attach cable is terminated on both ends with mechanical connectors that plug directly into SFP+ slots the same as SFP+ transceiver modules to. The cable is fully passive, it does not have signal buffers or amplifiers. 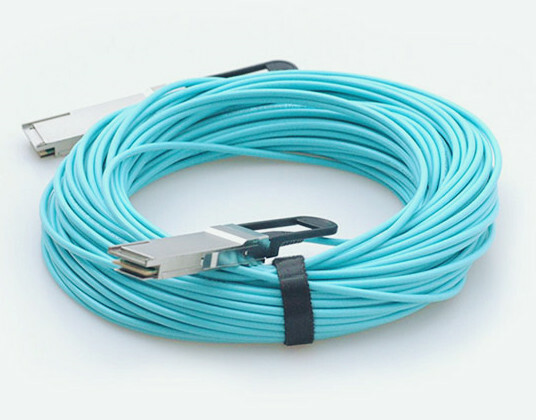 10G SFP+ Cable is an economical solution for interconnecting 10 Gigabit Net Optics products, also great for making short 10 Gigabit connections between network optic product and server, network switch, and monitoring equipment that have SFP+ slots. Direct attach cable assembly is a high performance integrated duplex data link for bi-directional communication. Have a wide selection of direct attach cables at FiberStore, there always has one meets your demand. This entry was posted in Direct Attach Cable and tagged Cat 7 cable, direct attach cable, network switch on June 7, 2013 by Admin.